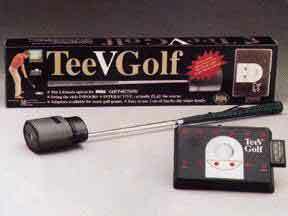 The TeeVGolf is an accessory for the Sega Mega Drive allowing users to simulate playing a game of golf. Versions for the PC and Super NES also exist. The TeeV Golf is an elaborate device which uses infrared beams to track the position a special golf club. This information is relayed back to the game as an alternative to a standard Control Pad. As all golf games play slightly differently, the TeeV Golf needs to be programmed depending on the current Mega Drive cartridge in use. To do so, the base unit allows for "adapter modules" to be inserted - the device shipped with a module intended for PGA Tour Golf by Electronic Arts, which had the side effect of making the device compatible with the game's successors. Other adapter modules were advertised to be ordered from Sports Sciences, but it cannot currently be proven if any were ever sold.